As a continuation of Our Savior’s Lutheran About Us – Our History page, we would like to provide this update of the history of the church since 2005. If you would like to read the first part of this rich tapestry of history, please visit the Our History page here. In 2005, lights for the parking lot were donated and installed and improvements and repairs were made on the parsonage. We established “Core Values”, “Bedrock Beliefs” a Vision, and a Mission Statement for our church in 2006. Two groups of volunteers went to Mississippi to work with hurricane Katrina victims. During 2006-2007 our sanctuary was improved by the addition of a new organ, air conditioning, and a new sound system. Thanks to fundraising and planning spearheaded by WELCA, a major kitchen remodeling project was completed just before Christmas 2007. Many major projects took place in 2008 in preparation for our church’s 50th Anniversary celebration. The altar was redesigned, a sound room was built, and new lights were installed. Then one Sunday, after a potluck, many willing workers of all ages took out the pews and the old carpet in the sanctuary, altar, and entry. By the next Sunday, the sanctuary was painted, new carpet installed, and the pews and furniture were back in place. The 50th Anniversary was held on July 27, 2008. At that time our membership had grown to 287 people. In attendance were several pastors and interim pastors, along with charter members as our special guests. We held a special dinner in the fellowship hall serving over 200 people. A program with a slide show followed the dinner. A memory book that looked back over 50 years of ministry was presented to each family, a cookbook was put together and published, and there were pewter ornaments sold for this special occasion. Pastor Chuck retired the next month and the council began the process of locating an interim pastor. Pastor Evelyn Johnson, a retired pastor from Hill City agreed to fill in for the church until a new pastor was found. We were blessed in 2009 with not one but two pastors. Pastor Becky and Pastor David Piper joined our church family on March 22. Pastor Becky was installed as our fourth full-time pastor and Pastor David was a quarter-time call. Their two young, red haired boys, Corban and Joshua completed their family. The building committee had a very productive year in 2010. Most of the year was dominated by church expansion. After ten months of planning and six weeks of labor with lots of help, two new classrooms and additional overflow seating to the sanctuary, along with a new Pastor’s office was completed on the north side of the church. Pastor David was called as a part-time mission developer for Woyatan Lutheran Church in Rapid City. 2011 we had many happenings to the grounds of the church. Through the dream of Connor Bushman and his Eagle Scout project, he initiated a new playground. Thanks to his family, friends and all who worked to make this a reality. His goal was to was to recycle metal to raise money for the project. The playground has filled a need in our community. Major repairs and remodeling took place at the parsonage for 2012. An amazing group came together to work on these projects. Again the grounds committee was very busy. They sold 22 trees that were planted along the north and east side of the church lot to the north. With the proceeds of the trees and several dinners held at the church, and were able to raise enough money to purchase an underground sprinkler system for the entire back lot. 2013 we experienced some changes. We hired Peg Tesch as our new church secretary. Joy Neugebauer retired as the first paid secretary after 8 years of service. Pastor Becky accepted the Community Circle for Education Award (on behalf of the church) with Becky Lowe for the PJ’s project for The Children’s Home Society of the Black Hills. The D.O.G. Night program continued to grow with an increase in parental help and new families from the community. We held a goodbye blessing for our ministry and service with Cornerstone Mission. The church received a new piano and a new furnace (the old furnace was a good one, it lasted over 30 years). The grounds committee was hard at work again putting in a rail fence next to the parking lot in front of the church, new sod between the fence and the sidewalk, and planting 5 flowering shrubs inside tree rings. The storage shed was moved north of the playground up against the sidewalk. It was another very busy summer for the grounds committee in 2014. The sprinkler system was installed, landscaping completed and seeding done in the back lot. A retaining wall was built on the west side parking lot and a wood fence put in next to church on the west side. The wood on the church, the deck, and the fences were stained and sealed. A new sound system was installed. Vacation Bible School week was a success. Dog Night started out with a new curriculum for the year. God’s Cupboard was open each month to help anyone needing food assistance. Pastor David was installed as Associate Pastor at Calvary Lutheran Church. Life in the church is always changing. People come and go. Babies are born. Children grow up and move to new places. Loved ones and friends among us come to the end of their lives. New folks move into the community and share church life. 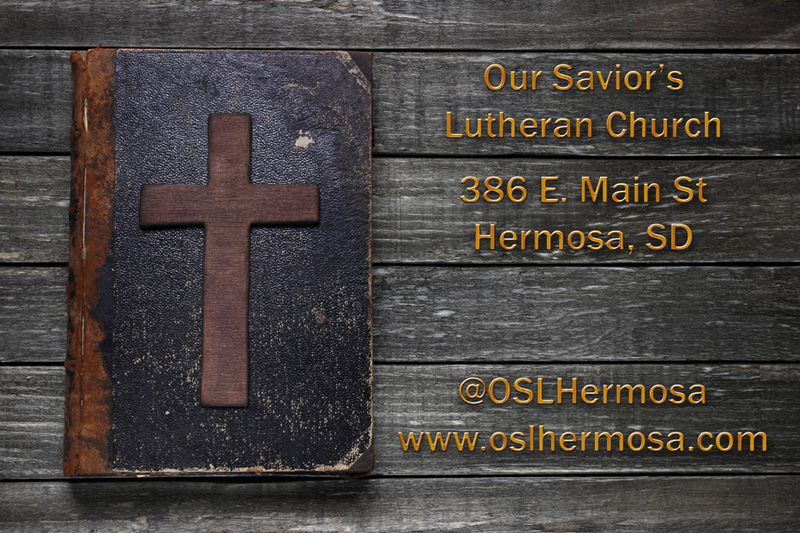 This brings us through 56 years of life for Our Savior’s Lutheran Church in Hermosa, South Dakota. We strive to continue to enrich the faith lives of everyone we come in contact with. We are always mindful of our mission, core values, and bedrock beliefs.